We understand from the mention of Sebek Efendi in the first written source about history of Ebru, “Tertib-i Risale-i Ebri”, that he has lived and died before 1608. We do not have enough information to distinguish his ebru from the others. He was preacher in Haghia Sofia Mosque. Died in April 1773. His works were used in many places and are easily recognized among others due to their distinctive design. Hatip ebru designs are named after him. Died during a fire trying to save his works. We do not have much information about his life, except that he was born in Vabakne city in Bukhara. He was the Sheikh in Ozbekler Tekkesi (Uzbekh Dervish Convent) in Istanbul. 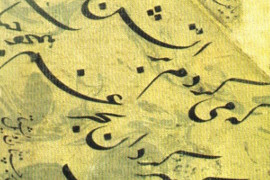 He studied ebru techniques in Bukhara and passed hiw knowledge to his sons, namely Edhem and Nafiz. He died in July 1846. Hezarfen Edhem Efendi is one of the most famous ebru masters. He was born in the Ozbekler Tekkesi in 1829. He is the son of Sheikh Sadik Efendi. He also became a sheikh as his father. He was proficient in Turkish, Arabic, Persian and Cagatai. 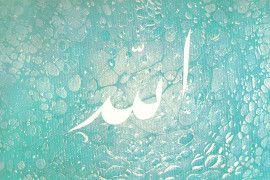 He also mastered arabic calligraphy art. He was a scientist, mathematician, carpenter, engraver, metal caster, blacksmith, architect. His title “Hezarfen” literally translates as ‘one who has thousand knowledge/skill’. Ebru is one of his skills, which made him famous and got him invited to the court by Sultan Abdulaziz. Only a small number of his works are preserved in the Ozbekler Convent today. On the cabinet where the originals are kept is written “Adornments are hidden in the cabinet, crafter is burried in the earth.”, composed by Edhem Efendi and upon his request inscribed on the cabinet after his death. He died in 1904. Brother of Edhem Efendi. He learned ebru from his father. Sheikh Aziz Efendi (1871-1934) learned ebru from Edhem Efendi during his attendance to Ozbekler Convent, however his interest in ebru was for his enjoyment. Born in 1885, Necmeddin Okyay, as his master Edhem Efendi, was given the title ‘Hezarfen’, since he excelled in many fields such as caligraphy, bookbinding, rose growing, archery as well as ebru. He was the ebru master of the twentieth century. He gave classes on caligraphy, bookbinding and ebru. He thaught ebru to his sons Sami and Sacid and his nephew Mustafa Duzgunman. Before Necmeddin Okyay, traditional ebru designs included primitive flower designs. He helped create more elaborated flowers and set a standard. Abdülkadir Kadri Efendi (1875 – 1942) is another student of Edhem Efendi. He was the imam and the preacher at Kadikoy Osmanaga Mosque. Bekir Efendi is known for his ebrus with battal pattern, which he sold at the stationers bazaar. we do not know much about his life and where he learned ebru. His ebrus were used in many official papers of that time. Sami Okyay, born to Necmeddin Okyay in 1910, learned ebru from his father and created some of the century’s masterpieces. He was also a engraver, bookbinder and gilder. He died of illness at a young age in 1933. Necmeddin Okyay’s youngest son, Sacid Okyay, born in 1915, was occupied in teaching ebru and traditional bookbinding at the Academy of Fine Arts. He died in 1999. Born in 1920 in Uskudar, he started his studies in ebru and bookbinding at the Academy of Fine Arts in 1938. However, he had to quit school and to go back to working at his fathers spice shop. 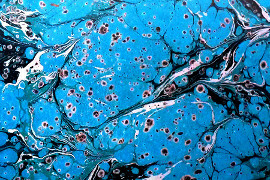 He continued practicing ebru until his death in 1990. He held on to the traditional ebru designs and at the same time contributed to it by designing new flowers and training many students. Born in 1927 in Uskudar, he learned ebru from Mustafa Duzgunman. He also mastered rosary-making and reed flute.